Biotech Breakouts Review – Is Kyle Dennis Legit? Kyle Dennis is another one of those stock trading millionaires selling a newsletter service. He is the owner of Biotech Breakouts, an educational platform that teaches members how to profit from trading biotech stocks. It’s well known the biotech sector is extremely volatile and unpredictable. Shares explode or crash solely on the results of FDA approvals. Kyle is a former student of Jason Bond, so I’m suspicious of him right from the beginning. On his website, he claims to have turned $15,253 into $3 million in only a few years without working on Wall Street. Obviously, this is an insane return on investment but there’s no proof that this story is 100% true. There are hundreds of scam artists on the internet taking photo’s beside a rented Porsche, claiming they can help anyone make profits day trading. This is why I’m always skeptical no matter how many positive reviews I read. From browsing through his website, it’s clear he understands how to market himself effectively. In the video on his homepage, he details his journey from heavily indebted college student to millionaire day trader. After graduating from UCLA he had no idea what career he would pursue. Kyle took a low-paying as a Real Estate Analyst for $35,000 per year. Sick of the 9-to-5 grind, he turned to stock trading to change his lifestyle. The first year of trading was rough and decided he needed a mentor to shorten his learning curve. Discovering Jason Bond Picks was a critical turning point. 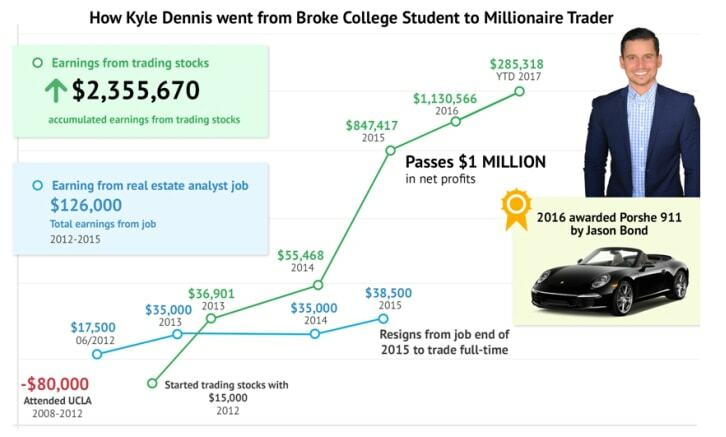 Over the next two years day trading, he made $800,000, enough money to leave his job and trade full-time. Once Kyle surpassed $1 million in profits, Jason Bond awarded him a brand new Porsche as a present for becoming his first millionaire student. Hundreds of beginner traders were keen to learn Kyle Dennis’ “secret” biotech strategy that made him millions. Because of such high demand, he started an educational service, biotechbreakouts.com. 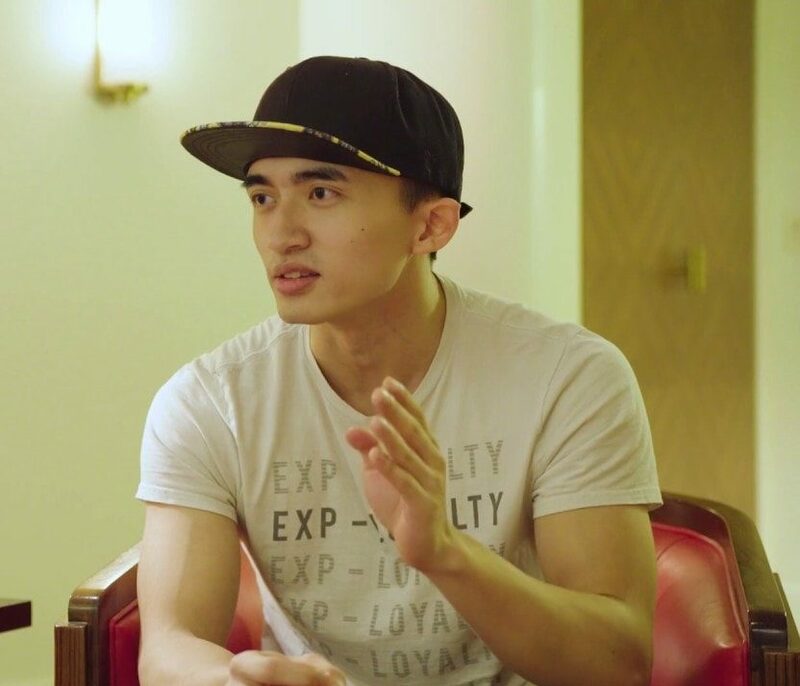 Kyle claims he wants to give back to the community by teaching others how to trade. In reality, Kyle is an entrepreneur and understands there is money to be made selling online courses. Since launching in 2016, thousands of people signed up. Thousands of people paying $129 per month is a nice passive income stream. Teaching is hugely lucrative and Kyle is a self-made millionaire with a net worth of at least $2 million. Biotechbreakouts.com has three different products; Lightning Alerts, FDA Insider Alerts and The Nucleus. Lightning Alerts is a day and swing trading program for short term traders. Keith Kern is a mentor within the service and has 20 years experience in the stock market. A moderated chat room with a community of like-minded traders. Two daily watch-lists with buy and sell ranges. Real-time buy and sell alerts via text & email. Overall market commentary and EFT analysis. FDA Insider Alerts is a swing trading newsletter that focuses purely on biotech stocks awaiting FDA approval. These companies are quite volatile because a majority of the time their future rests on how effective their drug is. If a small bio-pharmaceutical penny stock releases positive clinical studies, they can easily move 50%-100% in a single day. A negative result and the share price can drop 50% in hours. The average holding period is one to four weeks, so its suitable for those with full-time jobs. FDA Insider Alerts is expensive as it costs $399 per quarter. The program teaches a three-step plan for finding pharmaceutical stocks before they explode. The first step is to identify potential catalyst events that will positively impact share prices. These catalysts are typically results of clinical trials for drugs treating various illnesses. You can use BioPharmCatalyst.com to discover hot biotech stocks with big upcoming news. The second step is matching this event with a bullish chart pattern in a particular stock. The last step is fundamental research to find suitable buy and sell zones based on the risk involved. The ultimate aim is finding situations where the risk-to-reward ratio is favourable. Strong risk management skills are required as mistakes could destroy your trading account. Holding stocks hoping to recover losses is not a good strategy especially in the explosive biotechnology sector. The Nucleus service is a premium mentorship program that costs a whopping $9,999.00 per annum. The Nucleus program targets students serious about investing in their education. $10,000 is a big investment in yourself. In comparison, Tim Sykes’ millionaire challenge costs $5,000 and Sykes actually has multiple millionaire students. Access to Lightning Alerts and FDA Insider Alerts. Watch Kyle’s screen in real-time as he places trades using real money through his Etrade account. The objective for subscribers is to gain a better understanding of his strategies instead of blatantly copying trades. Chat room with personal access to Kyle Dennis, other programs only allow contact via email. Detailed daily watch lists with entry and exit points pinpointed. Intraday scans of the top stocks to watch for the next day. Real-time buy and sell ideas. Weekly webinars that cover topics such as technical analysis, price action, scanning and chart patterns. While Kyle started off as a student of Jason Bond in the Millionaire Roadmap program, he eventually broke away to form his own online business. The structure of Kyle’s service is very similar to Jason Bonds. Both teach via video lessons, chat rooms, live webinars, daily watch lists and real-time alerts. Their marketing strategies are identical and charge similar prices. The main difference is Kyle specializes in healthcare stocks while Jason focuses on companies in every sector. The two guys are also apart of RagingBull.com, a financial education website that has ties to penny stock promotion. Some of Kyle’s track record is publicly available on tipranks.com. Overall his performance is above average. Based on 26 trades, 15 were profitable with an average gain of 17.6%. The biggest winner was his +296.6% gain on Nektar Therapeutics. The data is limited, so it’s hard to assess his stock picking ability. At the bottom of his homepage, there are multiple positive reviews from current subscribers. While this looks great, there is no evidence to suggest that these success stories are real. If you read the disclaimer, it states the testimonials aren’t audited or verified. They could be real but who the hell really knows! It’s difficult to find any honest opinions, all of them seem biased. On trustpilot.com, out of 89 reviews, 97% of customers rated it five stars. I would like to see more honest opinions that weigh the pros and cons. Kyle’s story appeals to the average guy in their twenties who can relate to the scenario of being dead-broke after university. The whole purpose of his sales’ techniques is to create a connection with his target market to sell subscriptions. Just because he makes money from teaching it doesn’t make him a scam and there’s nothing wrong with monetizing your knowledge but prices should be lowered. At the end of the day, your success will come down your dedication to learning and finding a strategy that works for you.